Fall is full of many activities that the Be My Eyes volunteers would love to assist you with. Two park benches. 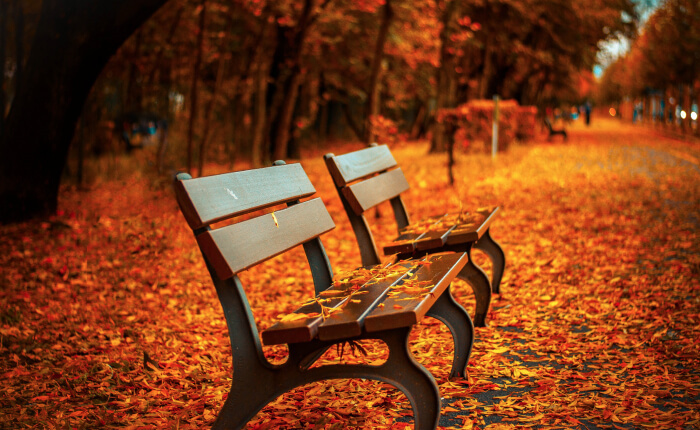 The ground and the benches are covered in orange fall leaves. Fall is upon us, and for most people that means a turn in weather in the transition from summer to winter. It’s also a time where we cozy up and look forward to what’s to come. The fall calls for new activities, and as a blind or low-vision user there are plenty of activities where the Be My Eyes volunteers can be helpful. Organize your wardrobe. It’s time to get your summer wardrobe packed away and get all those warm and cozy sweaters out. Make the organizing easier by asking the Be My Eyes volunteers for help. Update your wardrobe. When organizing your wardrobe, you might have learned that you’re in need of an extra pair of winter boots or a new warm coat. As you go shopping, you can ask a Be My Eyes volunteer for help to make sure that you get the right size and right color. Adjust your thermostat. We’re moving into colder times, and it might be necessary to turn up the heat to stay warm. Why not ask a Be My Eyes volunteer to help you adjust your thermostat to get just the right temperature? Take a hike. Why not take a hike in the beautiful autumnal nature? You can get a Be My Eyes volunteer to describe the nature and the beautiful colors to you. Drink hot chocolate. After a long walk, nothing beats warming up with some hot chocolate. A Be My Eyes volunteer can help you set the timer on your microwave, and your hot chocolate will be done in no time. And don’t forget to top it up with some whipped cream or marshmallows! Don’t want to make a cup yourself? Stroll down to your local cafe and have a volunteer read off the menu. Bake a pie. There’s no time like the fall for baking warm tasty pies. The Be My Eyes volunteers can help you read the recipe, measure the ingredients, set the oven to the right temperature, and set your timer correctly. They’d probably wish that they could also help you eat that delicious pie. Play a game. Fall is the best time for cozy indoor activities. And what’s more fun than playing a board game or card game? If you want to try out a new game, you can get a Be My Eyes volunteer to help you make the game accessible. In fact, our blind user Norbert often uses Be My Eyes to make different games accessible. If you want some inspiration on how to make games accessible, check out Norbert’s Community Story. Watch a movie. What’s a better fall activity than snuggling up with your favorite movie? A Be My Eyes volunteer can help you pick out the one you’re looking for from the shelf. Change your clocks. If you’re living in a part of the world that participates in Daylight Saving Time, don’t forget to set your clocks back one hour. Have a volunteer go around the house with you to make sure that all your clocks are set to the correct time. Rake leaves. Fall undoubtedly equals fallen leaves. When raking them, have a volunteer scan your garden to make sure you didn’t miss any. We hope that this gave you some ideas of how you can utilize the help from the Be My Eyes volunteers to get most out of the fall season. And remember, you can still use Be My Eyes for those regular tasks that will always be there - no matter the season.